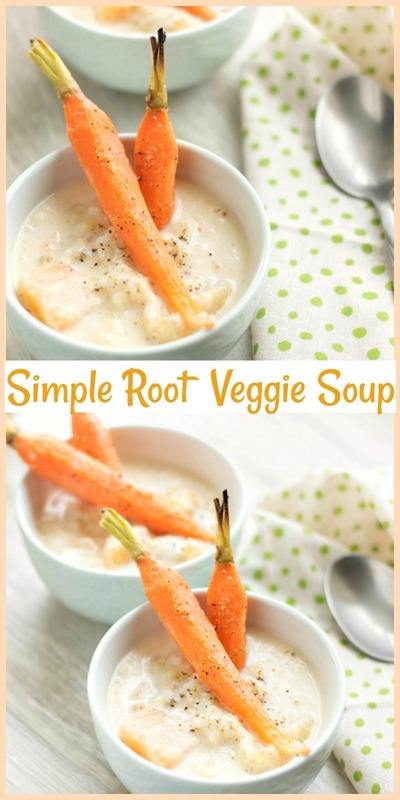 Simple Root Vegetable Soup – This soup recipe is one my family loves year round. It’s such a simple recipe, I can make it on a weeknight. Delicious and filling too. Enjoy every spoonful! There are so many things I love about soup. It’s great for lunch, dinner and always nice as a healthy snack. 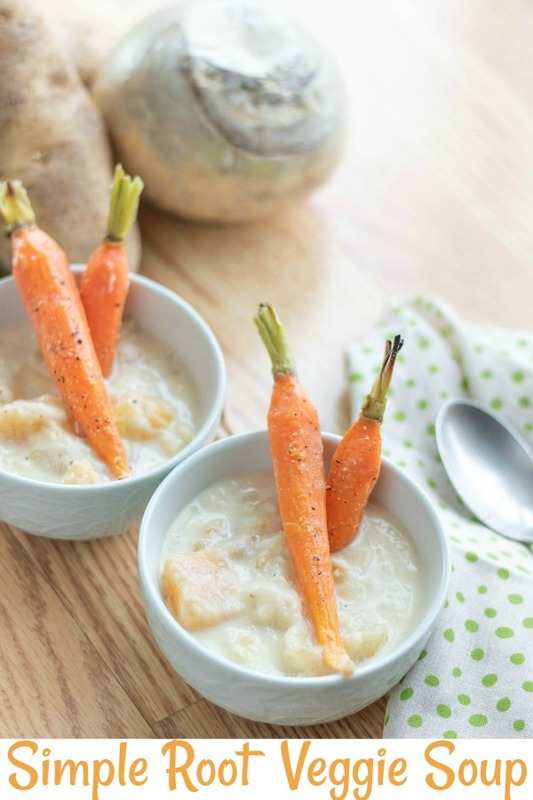 This soup recipe is quick and easy enough for me to prepare after a day of work. It’s therapeutic to me when I’m cutting up vegetable and that’s really what this recipe is about. 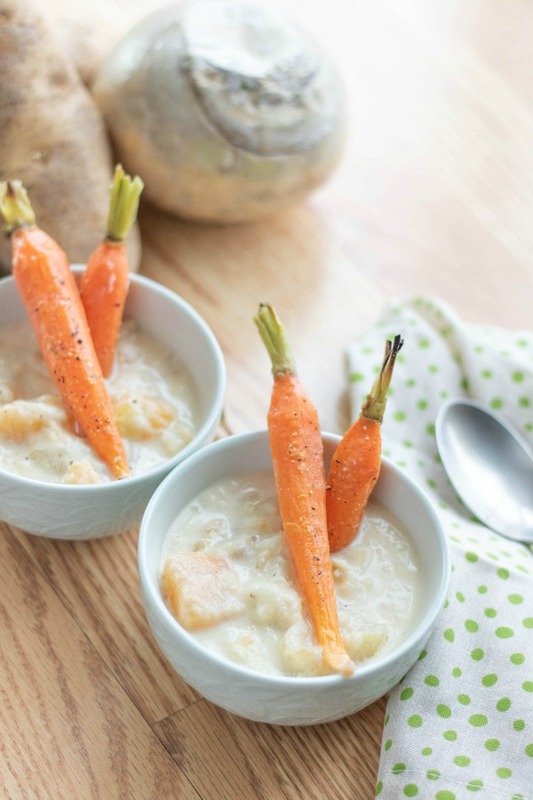 Nice hearty root vegetables with easy to find chicken or vegetable stock to bring this soup together. You’ll see in the directions, the carrots and onions have been roasted in the oven for a short time. This is an important step to bring out the natural sweetness in them. 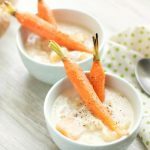 Once you make this soup, it’s sure to become a family favorite in your home like it is in mine. Don’t forget to serve with some nice crusty bread, you don’t want to miss one drop and the best part is soaking up the bottom of the soup bowl with some crusty bread. In a large pot, bring stock to a boil. Add in bay leaf and bullion or better than bouillon. Simmer for 30 minutes or until rutabaga is soft. Mash roughly half of the potatoes and rutabaga, leaving larger pieces. 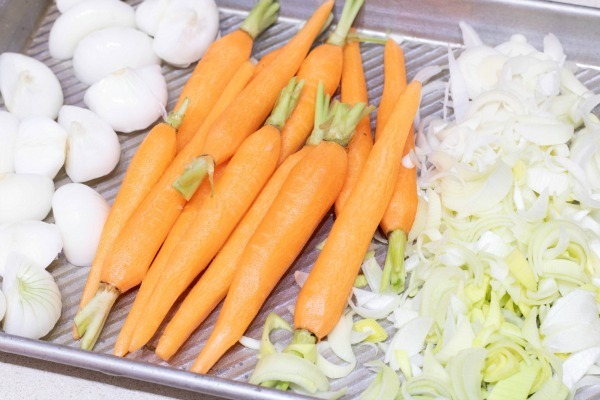 Halve onions, thinly slice white section of leek, and peel carrots leaving some greens attached. Place on baking sheet, drizzle olive oil over veggies. Roast for 15 minutes, remove leeks, add them to soup, and continue roasting onions and carrots for another 15 to 20 minutes. Add cream, stir a few times until combined into the soup. Add salt and pepper to taste. Stir again until combined. Remove from heat then remove bay leaf. Add the carrots and onions. Stir gently. Taste before adding more salt and pepper. Ready to serve up! 1.In a large pot, bring stock to a boil. Add in bullion or better than bouillon along with bay leaf. 2. 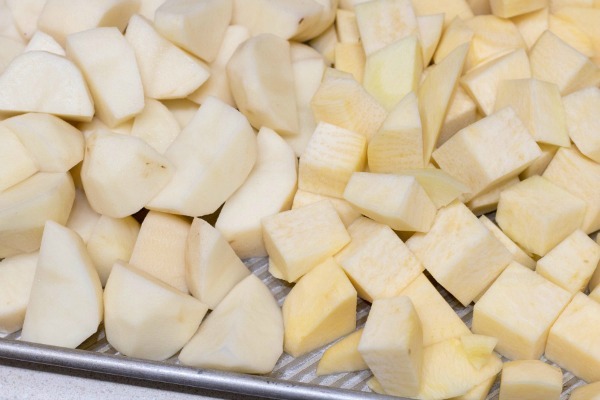 Lower heat, add rutabaga and potatoes, cover. 3. 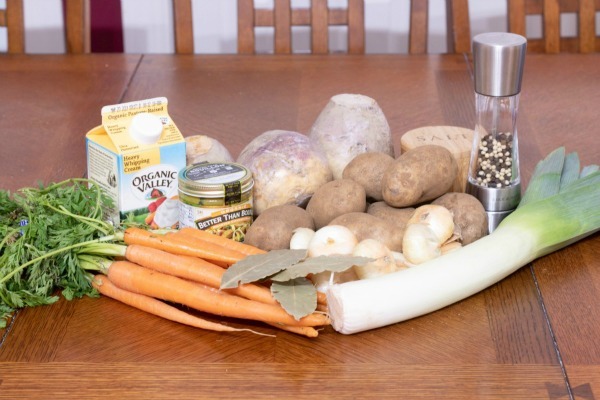 Simmer for 30 minutes or until rutabaga is soft. Mash roughly half of the potatoes and rutabaga, leaving larger pieces. 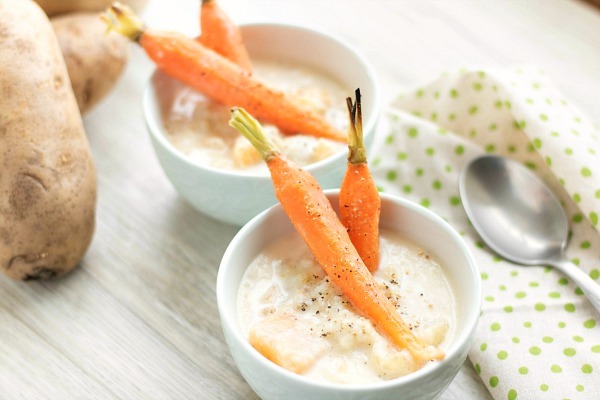 5.Halve onions, thinly slice white section of leek, and peel carrots leaving some greens attached. 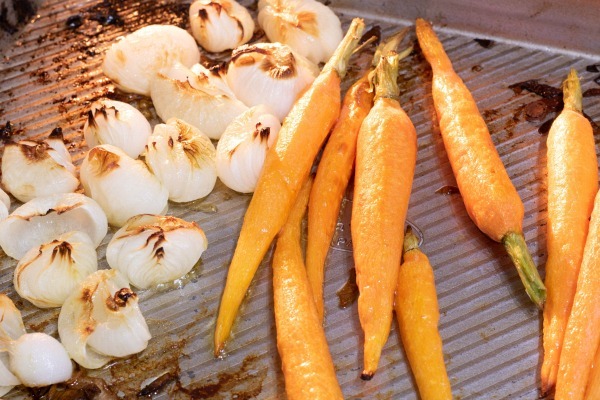 6.Place on baking sheet, drizzle olive oil over veggies. Roast for 15 minutes, remove leeks, add them to soup, and continue roasting onions and carrots for another 15 to 20 minutes. 7.Add cream, stir a few times until combined into the soup. Add salt and pepper to taste. Stir again until combined. 8.Remove from heat then remove bay leaf. Add the carrots and onions. Stir gently. Taste before adding more salt and pepper. Ready to serve up! Enjoy!